Lentil soup is definitely a family favourite, and after getting my mum's recipe recently, I decided to vary it slightly. I remember that my mum always used to add chopped frankfurters to the soup to make it a cheap meal for the family, although she stopped doing that during my time as a vegetarian, and with my youngest sister also turning veggie, they have never made a reappearance. Still, it doesn't really need anything like that added, but I do find that having some bacon in there, is definitely a nice addition. Today, I didn't have any nice Smoked Bacon in the fridge, but did have some Pancetta which needed using up. Normally, I would chop all the excess fat from the Bacon and add it to the soup after the stock, but with the Pancetta, I first fried it in its own fat, then, poured it out into a colander before starting on the vegetables. So it might not have been as fat free as my mum would like, but it was still fairly lean. I would have also added a stick or two of celery, but what I had in the fridge had seen better days. Also, instead of Bacon or Pancetta, I think this could also work well with some small pieces of Chorizo in it, although I would probably put far less Paprika in. If you are using Pancetta, first fry it off in the pan in its own fat, then remove and drain off the fat. Then add a little olive oil and cook the Onion, Red Pepper, Garlic and Carrots until the Onion is transparent and the Carrot is beginning to soften. Add the dried spices and ensure that everything is nicely coated, and then stir in the Red Lentils and add the Chopped Tomatoes. Mix the ingredients, and when it’s up to temperature, add the stock and bring to a simmer. If you are using Bacon, you should add it to the soup at this point so that it cooks with the Lentils. Simmer for about 30 minutes until the lentils are cooked. 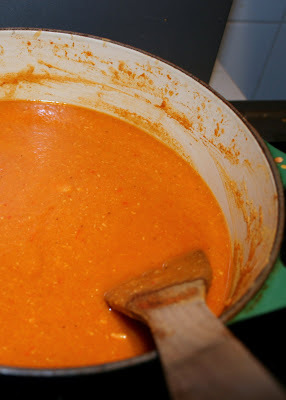 Finally, puree half the soup before serving. If the soup is too thick for your liking, add a little more stock. You could serve this as a starter, but is a pretty filling and hearty soup, so I tend to have it as a main meal instead. If you are having it as a starter, then the amount here would probably serve about 8 people. 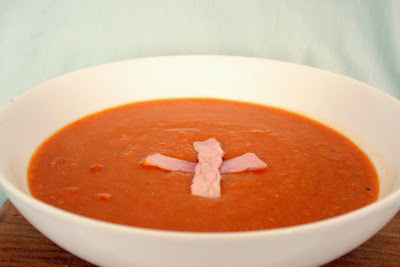 I had an urge for a hearty lentil and bacon soup.. just what you need when it snows at easter. I didnt have any red pepper (will add that next time) but just had to add in a handful of wholewheat pasta, just after the puree stage... really transforms a soup as a starter to pure comfort food. Looking forward to curling up on the sofa with glass of wine & bowl of soup .. I was looking for a more flavorful red lentil soup, and I've found it! I made this tonight. I used half the amount of pancetta but all of the fat it threw off (which wasn't very much). I did not have a red pepper, but I added one extra carrot plus a small parsnip. When I needed more liquid toward the end of the cooking, I added one cup of white wine. We ate it with toasted ciabatta spread with goat cheese. Would be great with a salad, too. Delicious. The smoked paprika is great. Thank you for the recipe!